Carpet Depot carries products of all major carpet manufacturers, such as Shaw, Mohawk, Beaulieu and Royalty. Selecting a carpet is an important process because it's a decorating investment you'll want to enjoy for years to come. Carpet Depot wants you to be able to be make a better-informed decision. This guide will give you basic information on carpet fibers and construction, how to judge equality and performance, and how to determine which carpet is best suited for each room or area. By reading this information you'll soon understand the jargon of carpets. And, most importantly, you'll gain the confidence to help select the best carpet for your decor, budget, and lifestyle. Plush is a well sheared carpet which is tufted with very fine denier fiber that makes it a very soft and smooth and gives it a formal look. Velvet plush carpets do not hide footprints well. Loop or berber carpets with tufts of equal height or multi-level loops are marked by a continuous uncut surface that resists crushing and matting. Multi-level loops form beautiful patterns using solid or multi colors. Berber style loop carpets wear well and are suited for any room. Texture carpets, curled or twisted tufts make for a textured surface that helps mask footprints or vacuum marks.Textured carpets are suitable for less formal decors. Saxony carpets are densely tufted level-cut pile. Yarn tufts are closely packed, presenting a smooth, luxurious surface. Generally for formal settings. Frieze carpets are a type of textured carpets with highly twisted tufts that curl at the pile surface. Especially suitable for higher traffic areas. Frieze carpets are less likely to show vacuum marks or footprints than other cut pile styles. Nylon is the most common and widely used fiber in construction of carpet. The soft texture of nylon holds the color well, and depending on the stain protection used on it resists most food and beverage stains, and many oil-based stains. Nylon carpet is easy to clean, however, depending on the dying system, is susceptible to fading in direct sun light. Wool carpets are warm and durable, but can be damaged by alkaline cleaning detergents. They are also available in fewer shades because they do not take bright color dyes well. Wool carpets absorb moisture in the air and therefore are not recommended for high humid climates and around beaches. Wool carpets are normally more expensive than synthetic fibers. 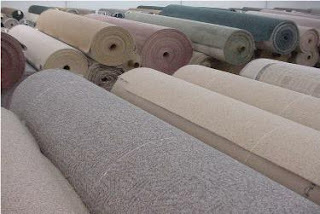 Polyester carpets, although normally not as soft as nylon, but are very durable and resilient. Polyester fibers have advanced tremendously in the past couple of decades, and today's PET (polyethylene terephthalate) polyester which is mostly recycled plastic bottles has the highest stain protection and resiliency. PET polyester carpets are naturally resistant to soiling and stains and this property can not be worn out or washed out in time. PET fibers have a greater capability to accept dye, and therefore the color shades are richer, truer, and brighter than other yarns. Since the color is added to PET fibers during the dyeing process, it provides excellent resistance to sun fading and harsh cleaning. PET polyester carpets absorb almost no moisture and are recommended for beach homes, and homes with lots of sun light.